Great stripped down hip hop with wonderful archival footage from Aboriginal political history for the video clip. From Baker Boy with Cloud 9. Rapping in the Yolngu Matha language of his homelands. Today I was on ABC radio talking about privilege and cultural appropriation on a panel with the wonderful nurse academic, Ruth De Souza, Aboriginal educator, Carol Vale and Aboriginal artist, Tony Albert. They were all so impressive. Child neglect is filtered through a lens of bias that makes black mothers and poor mothers particularly vulnerable …all the more so when they parent in public space. “In its majestic equality, the law forbids rich and poor alike to sleep under bridges, beg in the streets, and steal loaves of bread.” – Anatole France. “Mother jailed for letting her daughter run free – at the playground” by Brentin Mock in grist. “We’re arresting poor mothers for our own failures” by Bryce Covert in The Nation. You’ve probably heard the name Shanesha Taylor at this point. 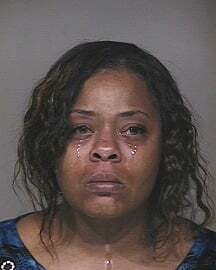 She’s the Arizona mother who was arrested for leaving her children in the car while she went to a job interview. Her story went viral thanks likely to a truly heart-wrenching, tear-stained mugshot. Taylor, who was homeless, says her babysitter flaked on her and she didn’t know what else to do while she went to a job interview for a position that would have significantly improved her family’s financial situation. “My son has been suspended 5 times. He’s 3” by Tunette Powell in The Washington Post. “Stolen Generation survivor had a long journey to love and care” by Martin Hoare in The Age. You yelled but exactly what you called out was lost in our memory of the night. And, you see, there had also been all this shouting we heard from the happy drunken kids who, as it turned out, must have passed by you in the dark. Even I don’t know how long you were there. All I know is that you became disorientated, and realising what was happening you crashed through my neighbour’s fence to fall on your knees, as though praying. With rising panic you shouted out once more with a strong but tight voice. Some of you long-term readers of this blog might remember when I talked about this incident here at the time that it happened.